The Constitution of the Democratic Republic of the Congo is the basic law governing the Democratic Republic of the Congo. The Constitution has been changed and/or replaced several times since its independence in 1960. The People's Party for Reconstruction and Democracy is a political party in the Democratic Republic of the Congo. It is the political structure established by the former president of the country, Joseph Kabila. 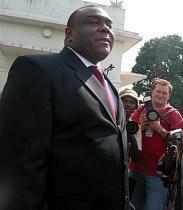 Jean-Pierre Bemba Gombo is a politician in the Democratic Republic of the Congo. 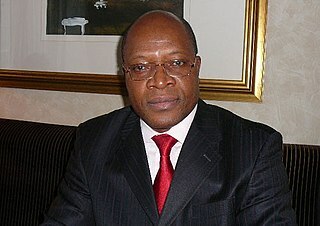 He was one of four vice-presidents in the transitional government of the Democratic Republic of the Congo from 17 July 2003 to December 2006. Bemba also leads the Movement for the Liberation of the Congo (MLC), a rebel group turned political party. He received the second-highest number of votes in the 2006 presidential election. In January 2007 he was elected to the Senate. Opinion polling is rare in the Democratic Republic of the Congo due to poor roads and lack of electricity. Nevertheless, the Congo Research Group (CRG) released a poll in October 2016 of 7,545 respondents in the country's 26 provinces. The poll found that 33% would vote for Katumbi, 18% for Etienne Tshisekedi, and 7.8% for Kabila. ↑ Voting postponed in the districts of Beni (8 seats), Beni village (2 seats), Butembo village (4 seats) and Yumbi (1 seat) until March 2019. 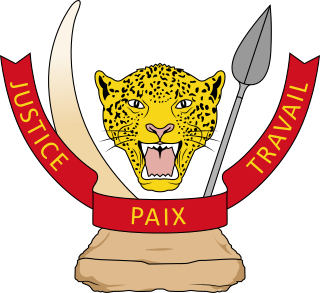 The Movement for the Liberation of the Congo is a political party in Democratic Republic of the Congo. It was a rebel group operating in the Democratic Republic of Congo that fought the government throughout the Second Congo War. It subsequently took part in the transitional government and is one of the main opposition parties. Dr. Oscar Kashala Lukumuena is a politician in the Democratic Republic of the Congo and was a candidate in the 2006 presidential election. Moïse Katumbi Chapwe is a Congolese politician and businessman. He was the Governor of the Katanga Province, located in the southern part of the Democratic Republic of the Congo, from 2007 to September 2015. He was a member of the People's Party for Reconstruction and Democracy (PPRD) until September 2015. 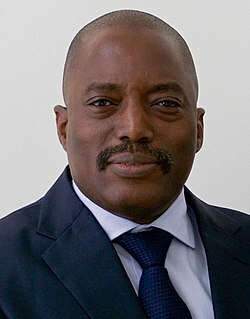 He has been described by The Economist as "probably the second most powerful man in the Democratic Republic of Congo after the president, Joseph Kabila". Jeune Afrique named him "African of the Year" in 2015. Monique Mukuna Mutombo is a Congolese politician. She declared her independent candidacy for the 2016 presidential election in March that year. Mutombo has been critical of the leadership of President Joseph Kabila. On 20 December 2016 the Democratic Republic of the Congo's president, Joseph Kabila, announced that he would not leave office despite the end of his constitutional term. Protests subsequently broke out across the country, which has never had a peaceful transfer of power since it gained independence in 1960. The protests were met with the government's blocking of social media, and violence from security forces which left dozens dead. Foreign governments condemned the attacks against protesters. Events in the year 2019 in the Democratic Republic of the Congo. 1 2 Alia Chughtai, Hamza Mohamed (28 December 2018). Democratic Republic of the Congo: Elections 2018. Al Jazeera. ↑ African support grows for Tshisekedi as DR Congo president. New Zimbabwe. Published 21 January 2019. 1 2 3 Tounsi, Samir (12 January 2019). Pro-Kabila camp wins DRC legislative poll, recount sought for presidency. Yahoo News. ↑ Opposition leader Felix Tshisekedi sworn in as DR Congo president. Al Jazeera. Published 24 January 2019. ↑ "Présidentielle en RDC : la Ceni reporte les élections au 30 décembre 2018". Jeuneafrique.com. 20 December 2018. Retrieved 30 December 2018. 1 2 3 4 5 "Joseph Kabila says he will not run again in Congo". The Economist . 8 August 2018. Retrieved 8 August 2018. 1 2 "DR Congo opposition picks joint presidential candidate". Yahoo News. Agence France-Presse. 11 November 2018. Retrieved 11 November 2018. ↑ "Congo's Tshisekedi and Kamerhe form presidential pact". Reuters. 23 November 2018. Retrieved 30 December 2018. 1 2 3 DR Congo election 'relatively well managed': SADC. Al Jazeera. Published 2 January 2019. 1 2 "DR Congo delays announcing poll result". BBC. 5 January 2019. Retrieved 6 January 2019. 1 2 Opposition candidate Felix Tshisekedi wins DR Congo presidential poll, says electoral commission. France 24. Published 10 January 2019. 1 2 3 The Latest: Opposition candidate Fayulu denounces results. Associated Press. Published 10 January 2019. 1 2 3 DRC opposition candidate Fayulu to file election result challenge. Al Jazeera. Published 11 January 2019. 1 2 DR Congo presidential election: Church questions results. BBC. Published 10 January 2019. 1 2 DR Congo court to examine election appeal from Tuesday. The East African. Published 14 January 2019. 1 2 3 4 DR Congo rejects African Union demands to delay election results amid concerns over 'rigged vote'. The Telegraph. Published 18 January 2019. 1 2 3 The Latest: Congo runner-up: Don't recognize Tshisekedi. ABC News. Published 19 January 2019. 1 2 DR Congo top court upholds Tshisekedi presidential election win. France24. Published 19 January 2019. ↑ Wilson, Thomas; Mbatha, Amogelgang (29 September 2016). "Congo Election Body Proposes Two-Year Wait for Presidential Vote". Bloomberg BusinessWeek . Retrieved 29 September 2016. ↑ "Congo, Democratic Republic of the". The World Factbook. Langley, Virginia: Central Intelligence Agency. 17 October 2018. Retrieved 24 October 2018. DRC Government has delayed national elections, originally slated for November 2016, to December 2018. ↑ Patient Ligodi, Amedee Mwarabu (5 November 2017). Congo sets presidential election for December 2018. Retrieved 8 March 2018. ↑ Congo presidential election on course for December, says prime minister. Standardmedia.ke. Published 8 March 2018. Retrieved 8 March 2018. ↑ DR Congo Faces Call For Standstill Over Protest Deaths. Channels Television. Published 9 March 2018. Retrieved 9 March 2018. ↑ Year of anti-Kabila protests in DR Congo leaves 47 dead: UN. Yahoo News. Published 19 March 2018. Retrieved 19 March 2018. ↑ DR Congo: Opposition Under Assault. Published 28 August 2018. Human Rights Watch. Retrieved 30 August 2018. ↑ Mohamed, Hamza (26 December 2018). DR Congo election board delays vote in three cities. Al Jazeera. ↑ DR Congo: Nearly 900 killed in ethnic clashes last month, UN says. BBC. Published 16 January 2019. Retrieved 21 January 2019. ↑ Nearly 900 killed in ethnic violence in Congo in mid-December -UN. Reuters. Published 16 January 2019. Retrieved 21 January 2019. 1 2 Constitution of the Democratic Republic of the Congo (PDF), 2005. Retrieved 2 March 2018. ↑ team, Reality Check (15 December 2018). "Why do voters mistrust electronic voting?". BBC News. Retrieved 15 December 2018. ↑ Adebayo, Bukola (13 December 2018). "Fire destroys 8,000 voting machines 10 days ahead of Congo's presidential election". CNN. Retrieved 15 December 2018. ↑ Kumar, Ashish. "Congolese Opposition Leaders Join Forces". Atlanticcouncil.org. Retrieved 20 September 2018. ↑ Bemba disqualification expected: DRC opposition must unite – Katumbi. Africa News. 4 September 2018. 1 2 3 4 5 6 25 line up for DR Congo presidency. 12 August 2018. ↑ DR Congo's top court confirms Bemba's exclusion from presidential election. Africa News. 3 September 2018. 1 2 3 4 All six banned DR Congo vote candidates appeal. 29 August 2018. ↑ "DR Congo bans former warlord Jean-Pierre Bemba's from presidential elections". The Independent. 25 August 2018. Retrieved 20 September 2018. ↑ DR Congo opposition rally behind exiled leader Katumbi. 10 March 2018. ↑ "Congolese oppose extension of Kabila's mandate, poll shows". Reuters. 2016. Retrieved 22 January 2018. ↑ CRG (23 May 2017). "CRG/BERCI public opinion poll: The Takeaway | Groupe d'Etude Sur le Congo". Congo Research Group. Retrieved 22 January 2018. ↑ "RDC: Elections: des opposants en tête d'un sondage — La Libre Afrique". Afrique.lalibre.be. 2 March 2018. Retrieved 20 September 2018. ↑ "Moise Katumbi scores more than 50% votes in opinion polls – Mwebantu". Mwebantu.com. 15 June 2018. Retrieved 20 September 2018. ↑ "Elections 2018 : Redistribution des rapports de force politique" (PDF). Nouveau sondage GEC/BERCI: Redistribution des rapports de force politique | Groupe d'Etude Sur le Congo. Congo Research Group. Retrieved 19 December 2018. ↑ "Evidence of internet shutdowns in DRC amid election unrest". NetBlocks . 2018-12-31. Retrieved 2019-02-24. ↑ "DRC authorities cut internet and broadcast signals after election". Committee to Protect Journalists. Retrieved 2019-02-24. ↑ Burke, Jason (31 December 2018). DRC electoral fraud fears rise as internet shutdown continues. The Guardian. ↑ Western powers urge DR Congo to restore Internet. Daily Nation. Published 2 January 2019. ↑ 'Tense period': Pressure mounts as DR Congo awaits vote results. Al Jazeera. 5 January 2019. ↑ DR Congo election observers say setbacks kept many from voting. Al Jazeera. 3 January 2019. ↑ Freytas-Tamura, Kimiko de (4 January 2019). Opposition Leader Is Seen by Church as Winning Congo Vote. The New York Times. 1 2 "As Congo Delays Election Results, People's Suspicions Rise". VOA. Retrieved 10 January 2019. ↑ David Choi. "Trump deploys 80 US troops to Gabon in case 'violent demonstrations' occur after contentious presidential election". Business Insider. Reuters. Retrieved 6 January 2019. ↑ Embassy Warns Americans to Leave Congo. Voice of America. Published 9 January 2019. ↑ Armstrong, Mark (6 January 2019). DR Congo election results delayed. Euro News. ↑ DR Congo result delay: Voters 'must be patient'. BBC. Published 6 January 2019. ↑ "DRC poll hub: CENI ready with results, security high in Kinshasa". Africa News. Retrieved 10 January 2019. ↑ "Congo police gather outside electoral commission". ABC News. 8 January 2019. Retrieved 10 January 2019. ↑ DR Congo opposition candidate Fayulu says results 'not negotiable'. BBC. Published 9 January 2019. ↑ SA, Zambia call for speedy finalisation of DRCongo vote result. The Citizen.South Africa Published 9 January 2019. ↑ Kabila accepts loss of party’s candidate in DRC elections, says advisor. Ewn.co.za. Published 10 January 2019. 1 2 3 4 DR Congo election: Defeated candidate vows legal challenge. BBC. Published 11 January 2019. ↑ DR Congo: Ruling coalition wins legislative majority. Deutsche Welle. 12 January 2019. ↑ "RDC : Félix Tshisekedi élu président, selon les résultats provisoires". 10 January 2019. ↑ "DR Congo presidential election postponed in three areas". BBC.com. 26 December 2018. Retrieved 9 February 2019. ↑ Runner-up in Congo's presidential election dismisses results as an 'electoral coup'. Reuters. Published 10 January 2019. ↑ Keane, Fergal (10 January 2019). DR Congo poll: The divisive aftermath of Tshisekedi's victory. BBC. 1 2 "DR Congo election: Candidate Martin Fayulu appeals against result". BBC News. 12 January 2019. Retrieved 12 January 2019. ↑ Tom Wilson, David Blood, and David Pilling (15 January 2019). Congo voting data reveal huge fraud in poll to replace Kabila. Financial Times. Retrieved 17 January 2019. 1 2 Huge election fraud revealed in DR Congo. France24. Published 17 January 2019. Retrieved 17 January 2019. ↑ 2 police, 2 civilians killed in DR Congo vote result protest. The East African. Published 10 January 2019. ↑ Burke, Jason (11 January 2019). Runner-up in Congo election says he beat official winner by wide margin. The Guardian . ↑ Dozens killed, wounded in wake of Congo election results - U.N.. Reuters. Published 18 January 2019. Retrieved 20 January 2019. ↑ France, Belgium cast doubt on DR Congo election result. Al Jazeera. Published 10 January 2019. ↑ The Latest: Police, military seen near Congo opposition area. The Miami Herald. 10 January 2019. ↑ DR Congo election: Sadc proposes unity government. BBC. Published 13 January 2019. ↑ Regional body SADC calls for DR Congo election vote recount. Al Jazeera. Published 14 January 2019. ↑ UN urges DR Congo to respect election outcome. France24. Published 15 January 2019. ↑ Foreign governments divided over Congo election fraud. Financial Times. Published 16 January 2019. ↑ Russia, China push UN to stay out of DR Congo poll dispute. France24. Published 11 January 2019. ↑ African Union urges DR Congo to delay final election results. BBC. Published 17 January 2019. 1 2 African Union calls on DRC to delay election announcement. The Guardian. Published 17 January 2019. ↑ DR Congo slams African Union's call to suspend election result. Al Jazeera. Published 18 January 2019. ↑ DR Congo election: African leaders congratulate Tshisekedi. BBC. Published 20 January 2019. ↑ "EU, African Union signal support for contested Congo president-elect". Channel News Asia. January 22, 2018. ↑ "U.S. welcomes court certification of new Congo president". Reuters. 23 January 2019. ↑ DR Congo's top court begins hearing election appeal. Nation.co.ke. Published 15 January 2019. ↑ DRC poll hub: Court to give verdict on Fayulu's petition today. Africanews.com. Published 19 January 2019. 1 2 Congo's Martin Fayulu declares himself president, top court sides with Felix Tshisekedi. Deutsche Welle . Published 20 January 2019. 1 2 DR Congo court upholds Tshisekedi presidential election win. BBC. Published 19 January 2019. ↑ DR Congo internet restored after 20-day suspension over elections Al Jazeera. Published 20 January 2019. ↑ Swearing-in of DRC's Felix Tshisekedi 'may be postponed'. Nation.co.ke. Published 21 January 2019. ↑ Mwanamilongo, Saleh (21 January 2019). Congo Postpones Presidential Inauguration in Wake of Election Controversy. TIME Magazine. Retrieved 22 January 2019. ↑ "Felix tshisekedi sworn in as democratic republic of congo's president, replacing joseph kabila". Reuters. January 24, 2019. Retrieved January 24, 2019. ↑ DR Congo: Tshisekedi takes office, but Kabila's legacy casts long shadow. France24. Published 24 January 2019. ↑ DRC President Tshisekedi sworn in during interrupted ceremony. Africa Times. Published 24 January 2019. ↑ Violence in DRC after president's party crushing senate defeat. France24. Published 16 March 2019. 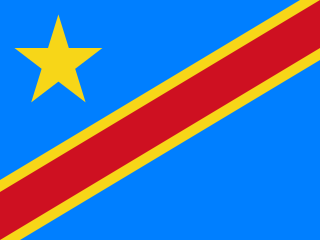 ↑ DRC ruling party fails to get Senate seat, Kabila coalition dominates. Africanews.com. Published 16 March 2019. ↑ DR Congo’s Ruling Party Demonstrates After Senatorial Elections. News Ghana. Published 18 March 2019.